What a challenge for an artist to meet face to face these four supports (electric towers) each weighing 6.8 tonnes and reaching a maximum height of 34 metres. To carry out her artistic work, Elena Paroucheva first conducted a thorough reflection on the city's history, to propose "a particular work for a particular city”. "The Source", the name given to the project, in this way entered into the history of art and electricity as a unique work in the French territory. 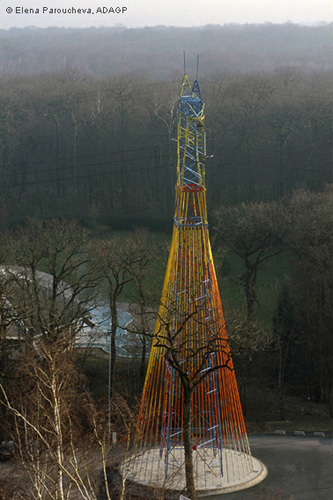 Delphine PAYAN, "Le Republicain Lorrain"
Stay cables and tubes of stainless steel over four high-voltage pylons on the "Amnéville - Montois" power line, carrying 225 000 voltes of electricity.